The theme this time is “Simple”, “Swift”, and “Characteristic”! The manifestation from these three are the 3 Clan Types below. Each clan belongs to one of the types above, and have their individual characteristics. More details about the new system, “Imaginary Gift”, that brings out the differences in clan types. As a blessing to your vanguard for achieving Grade 3, “Imaginary Gift” is a power bestowed by the fellow units! When you ride Grade 3 units with the Gift Icon, you can acquire a “Gift Marker”! 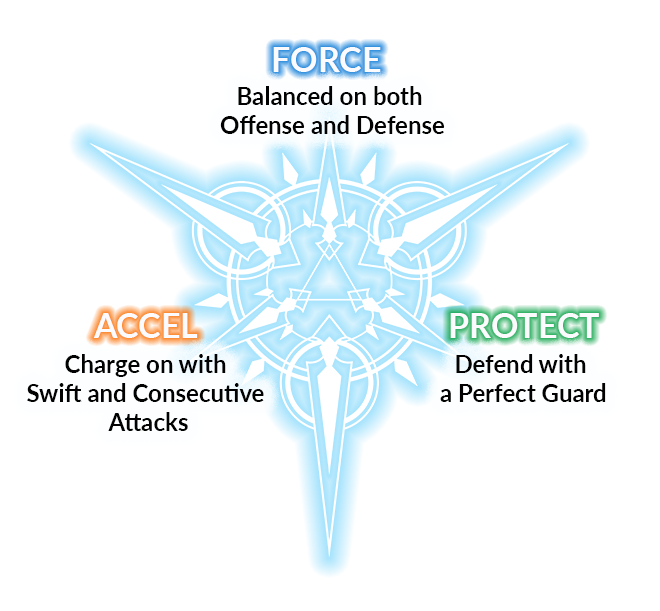 “Gift Markers” are separated into three types, namely “Force”, “Accel”, and “Protect”, each with their individual powers. The gift available depends on the clan used! Put “Gift Markers” of “Imaginary Gift: Force” face down, separate from your main deck. ※If sleeves are used for the gift markers, please use different sleeves from your main deck. When you ride a Grade 3 unit with the “Force” gift icon, put the “Gift Marker” on any one circle. 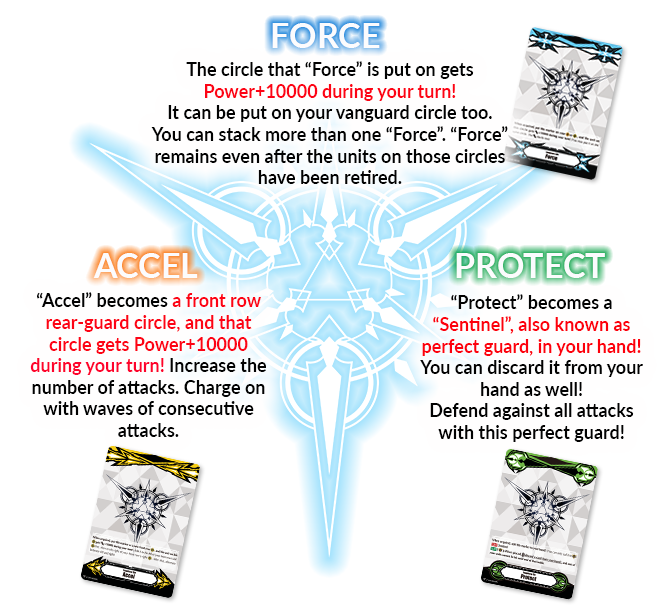 The unit on the circle that the gift marker “Force” is put on gets Power+10000 during your turn! More about Imaginary Gift HERE! Here comes a new trigger! It’s the Front Trigger! When it is triggered, all of the units on your front row get Power +10000! Make full use of the synergy with “Imaginary Gift: Accel” that increases your front row rear-guard circles! Also featuring the new “Critical”, “Heal”, and “Draw” triggers! These new triggers such as “Bringer of Good Luck, Epona” have been powered up too! A portion of the text and icons have been changed. The steps for mulligan have been changed. Each player chooses any number of cards in his or her hand and shuffles them back into his or her deck, then draws the same number of cards as he or she returned to the deck. Each player returns any number of cards in his or her hand to the bottom of his or her deck, draws the same number of cards as he or she returned to the deck, then shuffle the deck. The condition of “There are 2 or more cards in your G zone.” and removal of two cards from your G zone from play have been removed. The turn player looks at 5 cards from the top of his or her deck, chooses up to 1 card that is 1 grade greater than his or her vanguard from among them, shows it to his or her opponent, and puts it in his or her hand. If the turn player put a card in his or her hand, the turn player chooses 2 cards from his or her hand, chooses 2 cards from his or her G zone, reveals those 4 cards, and removes them from the game. The turn player looks at 5 cards from the top of his or her deck, chooses up to 1 card that is 1 grade greater than his or her vanguard from among them, shows it to his or her opponent, and puts it in his or her hand. If the turn player put a card in his or her hand, the turn player chooses 2 cards from his or her hand, and removes them from the game. The rules for normal calling a guardian have been changed. When normal calling cards to the rear-guard circle, the grade of the cards to be normal called must be equal to or lower than your vanguard. There are no conditions regarding grades when normal calling cards to the guardian circle. The stride conditions have been changed. Normal stride is only possible when both players’ vanguards are grade 3 or greater. Normal stride is only possible when both players’ vanguards are grade 3 or greater, or the turn player begins his or her turn with a grade 3 or greater vanguard. “This ability cannot be used until end of turn” has been changed. If this icon is right after [AUTO], [ACT], or [(zone name)], and the game state has been changed after resolution of that effect, “This ability cannot be used until end of turn” will be executed. The rule changes above will be in effect for all regulations from June 1st (Friday). →Check out the regulations here! Look forward to more exciting cardfights with these new rules! Can I mix both “Power +10000” triggers and “Power +5000” triggers in the same deck? Yes, you can. However, in this case, the total number of triggers in your deck still needs to be sixteen, and you may only have up to four cards with the same card name. Otherwise, please construct a deck according to the tournament regulations. Can I mix “Front Triggers” with other triggers in my existing deck? Also, how many “Front Triggers” may I have in my deck? Yes, you can mix “Front Triggers” with other triggers in your existing deck. Also, there is no limit to the number of “Front Triggers” you may have in your deck. However, the total number of triggers in your deck still needs to be sixteen, and you may only have up to four cards with the same card name. Otherwise, please construct a deck according to the tournament regulations. Can I use “Front Triggers” for all 16 trigger cards of my deck? Yes, you can. However, you may only have up to four cards with the same card name. Otherwise, please construct a deck according to the tournament regulations. Will the “all of the units in your front row get Power +10000” effect of the “Front Trigger” be applied to units called to the front row after resolving the effect? Will “Front Trigger” be resolved during damage check? Yes, it will. In that case, all of the units in your front row get Power +10000. For units with the “This unit cannot be chosen by trigger effects” continuous ability, can the “all of the units in your front row get Power +10000” effect of the “Front Trigger” be applied? Yes, it can. As the effect of front trigger does not require you to “choose”, Power +10000 will be applied to even units that cannot be chosen by trigger effects. The effect of “Zeroth Dragon of Zenith Peak, Ultima (G-BT14/002EN, G-BT14/SR01EN)” changes the choosing rule for triggers. How will “Front Triggers” be resolved? Power +10000 will be applied only to all of the units in your front row. 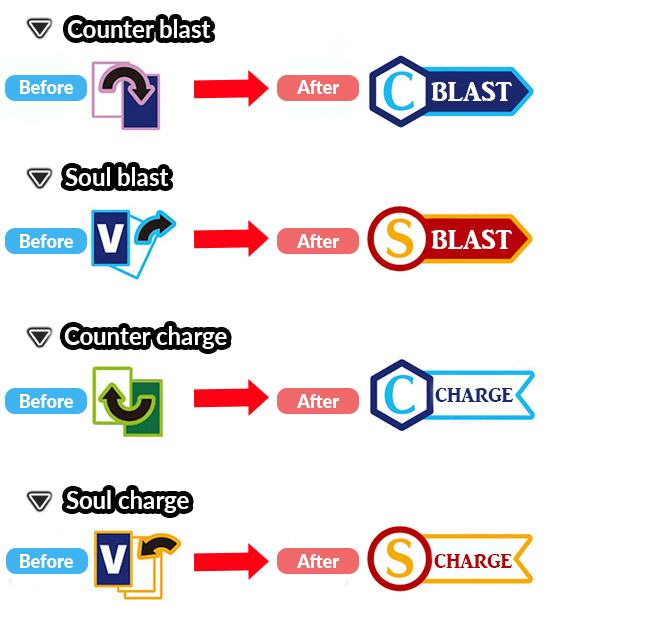 As the effect of “Front Trigger” does not require you to choose, its effect will not be changed by “choose all of your units for your trigger effects”. Even though the vanguard of both fighters are not grade 3 or greater, does this mean that as long as the turn fighter’s vanguard is grade 3 or greater at the beginning of his or her turn, he or she can [Stride] during the stride step of that turn? Yes, he or she may [Stride] during the stride step of that turn. When my opponent’s vanguard is grade 2, I rode into a grade 3 vanguard. Can I [Stride] in the stride step right after? No, you cannot. As neither “at the beginning of your turn, if your vanguard is grade 3 or greater” nor “both players’ vanguards are grade 3 or greater” is fulfilled, you cannot [Stride]. My vanguard is grade 3 at the beginning of my turn, and my opponent’s vanguard is grade 2. In this situation, though I can [Stride] in my “stride step”, can I [Stride] without paying the cost with effects like the “Ritual 3” ability of “Dragheart, Luard (G-TD10/003EN, G-BT09/S13EN)” and the automatic ability of “Doom Bringer High Flame (G-BT13/073EN)”? Yes, you can. In this situation, the condition of “at the beginning of your turn, if your vanguard is grade 3 or greater” has been fulfilled. Thus, [Stride] is possible, and, the cost for [Stride] can be modified due to effects. “Vampire Princess of Night Fog, Nightrose (G-TD08/004EN, G-BT08/S30EN, G-CHB03/Re:02EN, G-CHB03/S11EN)” exist as a vanguard. When the condition of “When your rear-guard is put into the drop zone” is fulfilled, the GB2 automatic ability is activated. At this moment, if I did not pay the cost, will this automatic ability be restricted until end of turn? No, as long as you do not pay the cost, the restriction of [1/turn] will not be applied, thus when this ability activates again, it can be resolved. I stride a G unit on “Mythic Beast, Fenrir (G-BT04/007EN, G-BT04/S05EN, G-BT08/S18EN)”, and gave a [1/turn] ability to the G unit on my vanguard circle. Then, due to various effects or cost, though cards have been put from my soul into the drop zone, I did not pay the cost for that ability. After which, will this automatic ability be restricted until end of turn? My “Magnum Assault (G-TD04/007EN)” or “Crayon Tiger (G-BT02/019” attacked a vanguard, I did not pay the cost for their abilities, and they attack again after they [Stand] due to various effects or cost. If they are attacking while boosted, can I pay the cost during those battles? An opponent’s rear-guard was locked while “Deception Star-vader, Nickel (BT17/122EN)” is on the field. If I did not pay the cost for Nickel’s ability at this moment, will Nickel’s ability be restricted until end of turn? 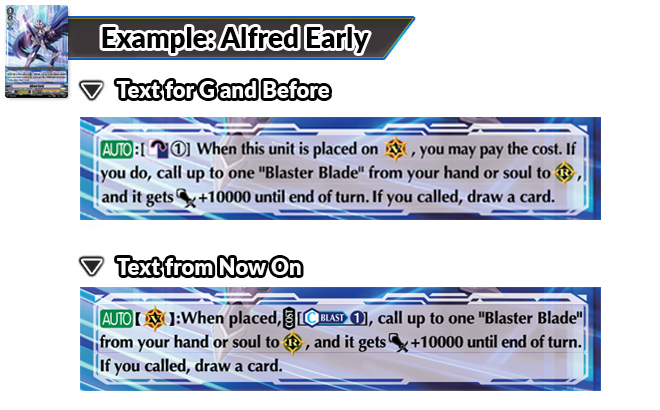 No, abilities until now with “This ability cannot be used for the rest of that turn.” in the text will be regarded the same way as [1/turn], thus it will activate again if you did not pay the cost. I rode ”Dragonic Overlord “The Legend” (G-LD02/004EN)” on “Dragonic Overlord (BT15/004EN)”, and gained a new automatic ability due to its LB4 automatic ability’s effect. Then, I gained another automatic ability due to its activated ability, and attacked a rear-guard. Though both automatic abilities state “At the end of the battle that this unit attacked a rear-guard”, both abilities will activate at the same time, I paid the cost for the automatic ability gained from “BT15/004 Dragonic Overlord”, and [Stand] it. During the second battle, as “At the end of the battle that this unit attacked a rear-guard” is fulfilled again, can I pay the cost for the ability that it gained due to its activated ability, and [Stand] it again? Yes, you can. As abilities with the text “Even if you do not pay the cost, this ability cannot be used for the rest of that turn” are regarded the same way as abilities with [1/turn] restriction, as long as the cost for that automatic ability has not been paid, when the condition is fulfilled again, the cost can be paid for resolution. At the end of the battle that “Tidal Assault (BT13/038EN, G-RC01/047EN)” attacked and hit a vanguard, can the fighter choose not to proceed with “[Stand] this unit, and this unit gets [Power] -5000 until end of turn”? Yes, you can. As the automatic ability’s condition is fulfilled, even if it activates, as the automatic ability has the [1/turn] restriction, the fighter can choose not to proceed with that effect. Also, the restriction of [1/turn] is not applied either.